A woman looks intent on her techniques of casting her fly fishing line after lessons by a fishing guide near Main Brook, Newfoundland. Standing in the middle of the Salmon River near the town of Main Brook, Newfoundland, a woman spends time practicing her fly fishing techniques after partaking in some lessons. These lessons ran her through the basic techniques that you must be able to do when casting your line so that nothing gets tangled and the fish will be attracted to your line. Landing the artificial fly in the exact location is one of the hardest things to learn in fly fishing. Fly fishing was once a way of fishing that was used in past years for catching trout and salmon but now people also use this specific way of fishing for pike, bass, panfish, carp, redfish, snook, tarpon, bonefish and striped bass. Other types of fish have been caught by fly fishermen over the years without even trying, they just happened to grab onto the line. 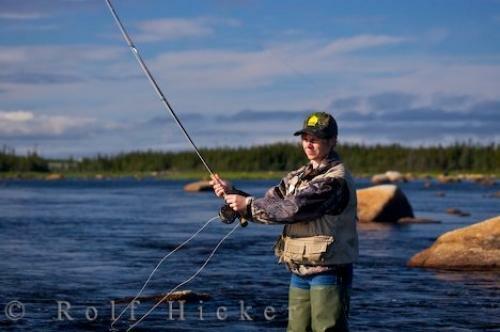 Photo of a woman that had a quick set of lessons to learn what fly fishing is all about near Main Brook in Newfoundland. Pictures from photo gallery "Fly Fishing Pictures"
This picture is part of the photo album "Fly Fishing Pictures" - there are more beautiful images waiting for you. ... Different types of casts are used depending on the conditions of the water. The forward cast is probably the one that is used the most and the simplest to perfect with other ones being the roll cast, the single or double haul, the tuck cast and the side or curve cast. Cold water fly fishing also requires the need for waders where you can stand at least knee height in the water. A fly fishing vest is also a good idea to have as you can keep all your flies and extra lines in the pockets of your vest. Fly fishing in the Salmon River near Main Brook, Newfoundland is a very peaceful location to try out what you learned during your lessons. While visiting Newfoundland, Canada and the incredible rivers in the area and fly fishing is an outdoor sport you would like try, there are many fishing guides around Main Brook that will help you through each step. I photographed this photo with the digital SLR camera model Canon EOS-1Ds Mark II, aperture of f/6.3, exposure time of 1/640 sec. on ISO 200, as always I used a original Canon Lens, the focus lenght for this picture was 130mm.